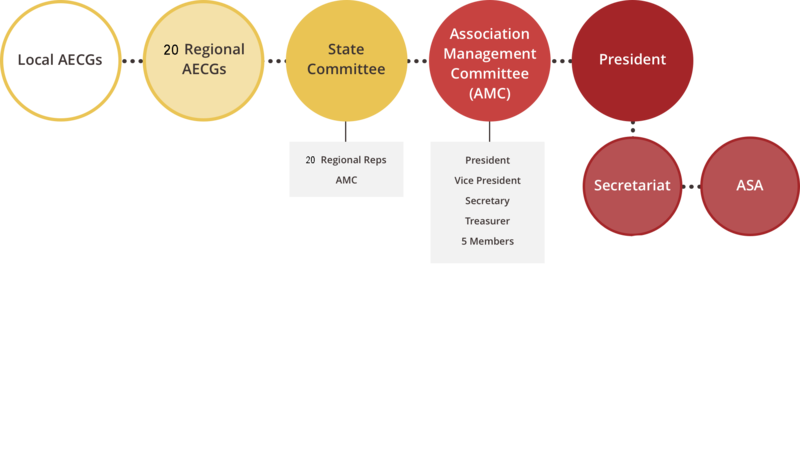 Structure of the NSW AECG Inc. The primary role of the NSW AECG Inc. is to promote active participation by Aboriginal people in the consultative and decision making process of education and training related matters. Our strong member base is key to the organization being the peak advisory body regarding Aboriginal Education and Training at both State and Commonwealth levels. As a wholly volunteer based organization, our key focus is ‘community first’; the educational rights of Aboriginal people in NSW being our driving force. The NSW AECG Inc. has local, regional and state network that enables effective communication allowing Aboriginal community viewpoint to be echoed throughout the organization. All the members of local communities can become members of the local AECG but only Aboriginal adults (18 years and over) can vote and hold office bearers’ positions. President, Vice President, Secretary and Treasurer make up the local AECG Executive. Other members make up the local committee. Meetings of the local AECG’s shall be held at least three times a year at a venue, date and time to be decided upon by the members. A nominated number of elected members (3 or 4) of each local AECG make up the Regional AECG but meetings are open to anybody. Only the two elected delegates can vote and hold office bearers’ positions. Chairperson, Vice Chairperson, Secretary, Treasurer and Regional Rep make up the Regional Committee. All 20 regional Reps plus the President, Vice President, Secretary and Treasurer of the Association. Meets two times a year. Plus 5 State Committee members – meet minimum 4 times a year. President, Vice President, Secretary, Treasure and State executive members. They are elected annually at the Council meeting. President’s term of office is for three years, all other office bearers are for a one year period. Meets once a year for the AGM; all delegates who attend the meeting are to be financial members of the Association. Voting at the AGM shall therefore be limited to the representative group of  people in person, or by proxy. The Aboriginal Studies Association also provides opportunities to engage in professional and personal learning and dialogue through the ongoing development of networks and learning communities.